Nick/Nero, a regular teenage boy turned delinquent, is sent into the wilderness with a handful of other troubled teens. All is going pleasantly well until the first morning into their hike. Nero and his "friends" wake to find their counselors have turned into contagious flesh eating monsters. Nero and the rest of his group must use their prior zombie survival knowledge to form a plan for survival. I have to say, this book was rather . . . twisted. So, me being the deranged person I am, genuinely enjoyed this epic tale of horror. But, it is definitely not for the squeamish. Well, for some reason, I ended up reading a majority of this at night. I'll leave it to your imagination to picture my reaction to reading a surprise-full-on-zombie-attack at 2 in the morning. The Infects was a really weird book, and I was able to really appreciate it as a horror movie lover. The start of the zombie apocalypse was like my worst nightmare come true. If you've read this already, you know what I'm talking about! But, if you haven't, when you do, you'll understand. All I have to say is, if I'm not immune, I would be in the first batch of zombies. I thought Nick/Nero and his fellow delinquents had a hilariously sick sense of humor. The dialogue made the entire book for me. I found myself chuckling out loud quite a few times (awkward). 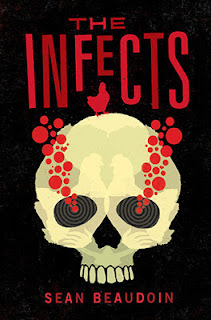 The Infects really filled my need for a horror-induced adrenaline rush. It was much better than a cheesy SyFy movie! While this book is not for everyone, if you love twisted horror stories, this book is for you! Sigh. If only I have the stomach for zombies. I absolutely loved this book! It is so twisted and sick and hilarious and smart and I could go on but I'll stop now! Glad I'm not the only deranged one around! !